I don't believe that this axial piston design puts much load on the motor (but I could be wrong), so my current design point for the motor is ~15,000rpm. My motor has a 2370rpm/kv rating, which puts me beyond 25k unloaded, so maybe 20-22.5krpm isn't that far outside of the realm of possibility, assuming that I can sink the heat into the receiver, casing, and main reservoir. The current iteration has a ~1"x3" DxH cylindrical reservoir which can store 18 shots before it is empty at 800psi... and takes 4.46s to fill and can sustain an embarassing 4rps rof... if I increase the rpm of the motor to 20k, that increases the rof to roughly 6rps, and that is with the motor running continously... I have the torque code somewhere that I can run for the latest iteration, but I'm guessing full auto is going to be a big power drain (I think last time I estimated something like 1 shot per mah, and that was with more optimistic numbers). What I think I want to explore next is replacing the outer barrel (since I've already taken it upon myself to build the "loader" into the hopup unit and have the barrel secured into the hopup (maybe threads or a bayonet lug), I'm considering also replacing the outer barrel and having a sort of tubular (ID/OD) main reservoir with the barrel running through it and then have the compressor in the stock. If you're following me on Facebook, you should be more or less up to date on the state of things. I've decided to move the major portion of the design of AHDS into the public domain, so this video outlines the current stage of development of the compressor-regulator subsystem and an broader system-level design. If you have any questions feel free to comment here, there, or in PM/email. This still does not include loading energy or powering anything but the bb. One of the things I'm considering in the final design is to use one of the WA WOC's as the platform for ADHS, so, for the moment, I am designing around those dimensions. Right now I'm deciding between a functional trigger break and full auto. The D60 block seems to be a safe bet, and I'd imagine that ~5-10rps is about as fast as one can pull the trigger. Personally, I prefer semi instead of full auto, maybe burst if it works well, so I'd choose the trigger break instead of FA capability, but I'd like your thoughts on this. So, I decided to run some quick calculations, and here's what I came up with. The calculations take into account the motor power, pump torque, pump/reservoir volumes, a conservative lb-in value for each shot and a 1000mah 3s battery. I used the torque equation to get me around to the maximum rpm I can run without exceeding the motor's specs, and this is probably the place where the calculated values will deviate the most from the actual results. I don't have a good intuition about how much power/flow the air nozzle mech will consume, but even the power consumption is doubled, we're still running at >1 shot/mah, which is still pretty darn good. The full auto rps is a little puny, but I guess it's close to the actual rof of an m4/m16, and this was supposed to be a semi-auto focused build. Also note, that the tank will refill before the ~9 shots are used up, probably between shot 1 and 5, depending on how much the regulating circuit can compensate and how weights are balanced between efficiency and accuracy. The first compressor iteration is pretty close to being finalized, I just need to decide on a few things like stroke and bore diameter. The broad design for the controller is coming along. The plan for the initial board is to tack my modifications onto an arduino micro (pressure sensors, adc, mosfets, solenoids etc). Since each component is dependent on other components, to save some time, the plan is to develop the regulator, controller and compressor separately. The regulator (solenoids, valves, air nozzle, etc) will be tested off of a 200psi shop compressor and a adc connected to a computer. The compressor will be tested with a servo tester, battery, speed controller, motor, as well as the adc/computer. In the meantime, the controller will be developed in parallel, and likely last. Late February - Complete internal testing phase and begin sending out test models. At some point I'll need to test the viability of the modular barrel concept and would like to close the control loop with either a doppler radar or chronograph. I'd also like to implement a hopup concept that I've been working on. The other thing I'll have to do is work on implementing a fire selector/trigger and make it compatible with some model of aeg. By the looks of things at the moment, the pricing for the entire system will be comparable to a P* setup, but I can't say for sure until I get a source for externals. 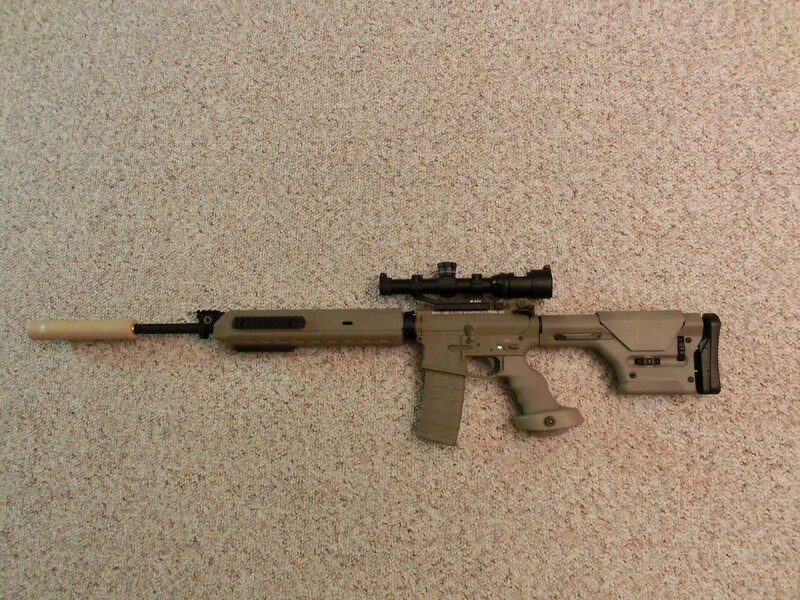 The first model is planned to be a semi-auto DMR-type gun. While the system might be compatible with multiple platforms, I'd like to standardize the externals for the first 6-12 months to ease troubleshooting and compatibility issues. If anybody has any externals they'd prefer, I'd like to know. Around the February/March time, I'll need to start integrating the internals and externals, so we need to plan ahead.